Amazon has been on a mission to become the company with ultimate control of your smart home for years now. To do that it's developed a smart speaker to suit every room, with the bedside Amazon Echo Spot to replace the alarm clock, for example, while the Amazon Echo Show sits in your kitchen and replaces both your secondary TV and cookbook all in one go. There’s the Amazon Fire TV Cube, which brings Alexa to the shelf beneath your TV and, finally, the new Amazon Echo Auto that will bring Alexa into your car for roadside assistance. But despite the fact there are so many old and new models to choose from, there's only one that's gone beyond just one room. According to Amazon it's also the best-selling speaker of all time. Drum roll please, it's the Amazon Echo Dot, which is now available in its third iteration in nearly as many years. You might think that because it's been redesigned a few times that previous versions were problematic or didn't quite hit the right spot. But that's not true at all. All of the older versions are still good, and the Dot just gets better and better each time. Like those previous models, what you get for the Amazon Echo Dot 3rd Gen’s modest price tag is something rather impressive: a smart speaker that makes calls almost anywhere in your country of residence, can control your smart home with a few commands and can stream music from a handful of the world’s top music streaming services. It may be small, but boy is it mighty! But despite all the iterations, the Echo Dot still lacks the essentials like a 3.5mm auxiliary cord. Yes, the latest version of the Amazon Echo Dot is the best one yet in our opinion. But is it worth upgrading to if you have a whole home's worth of smart speakers already? The short answer is: probably not. The Amazon Echo Dot 3rd Generation is available now for £49.99 / $49.99 / AU$79. That’s the exact same price previous models sold for just before it was launched, making it hard to criticize given its improvements to sound quality that we’ll discuss shortly. In the very near future this will likely be the only Amazon Echo Dot available on the market - you’ll still see 2nd Gen devices floating on store shelves for a bit longer, but soon Amazon Echo Dot product pages will all default to Gen. 3. Need a smart assistant and a new streaming device? Check out the Amazon Fire TV Cube, a new $119 streaming box from Amazon that's capable of both! The fabric mesh design helps the Amazon Echo Dot blend in with the rest of the refreshed Amazon Echo line-up, which received a fabric-covered makeover with last-year’s refresh. As a result, the new Echo Dot comes in colors to match the rest of the range, too, with Charcoal, Heather Grey and Sandstone shades. 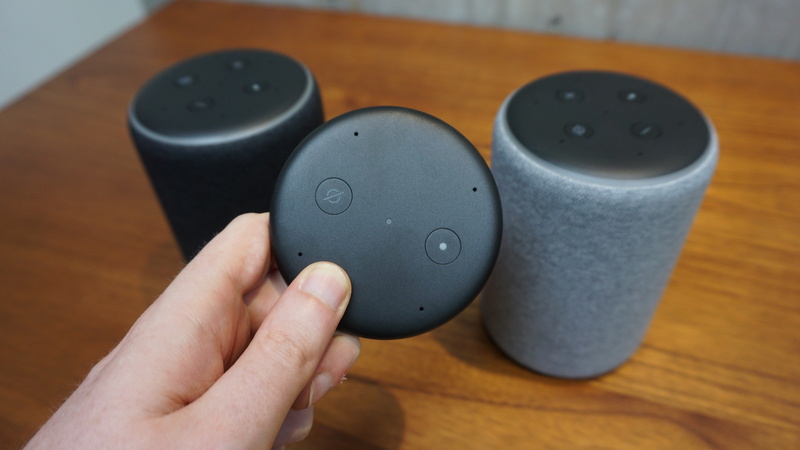 On the top of the Echo Dot you’ll find four familiar buttons that consist of volume up and down, microphone mute and Alexa, as well as a four microphone array. Activating Alexa either via the button along the top or by saying its name triggers the flashing blue ring of light that you’re used to seeing on other Alexa devices - though, on one of the units we were sent, there appeared to be a short (<1s) delay in between when we said the wake word and when Alexa started listening. Spin the unit around to the back and you’ll find the power jack plus an auxiliary 3.5mm jack that can be used to connect the Amazon Echo Dot to any speaker with a matching jack. Unfortunately, however, Amazon doesn’t include one of these cables in the box and the accompanying charger, which used to be microUSB, is now a proprietary design. These two small detractors aside, this is still one of the best-looking Amazon Echo Dots we’ve yet to see and, with a new color option, the most versatile, too. Getting the speaker setup is simple - especially if you have one or more Alexa devices already setup in your house. If that’s you, all you need to do is head into the Amazon Alexa app and tap the plus icon in the Devices section - the app will do a quick scan for nearby devices and before you know it you’ll be up and running with your new smart speaker. If you don’t have the Alexa or an Echo Device already installed, you’ll have to go through the process of downloading the app and signing into your Amazon account, but then it’s more or less the same process as above. That said, while it was always easy to setup an Amazon Echo device in the past, we’re very pleased with the refresh to the Amazon Alexa app that rolled out in the last few weeks. The re-work makes it easier to group devices together into rooms, as well as add additional smart devices to your arsenal of appliances. Unfortunately, Alexa itself hasn’t gotten the same kind of attention. That’s because Amazon has outsourced a lot of functionality to app designers who then create Skills for Alexa. These skills differ wildly in quality and utility with most of them largely falling into droll trivia games. The best Skills are likely in development right now - but, for now, what's available isn't really taking advantage of the excellent, voice-first system Amazon built. 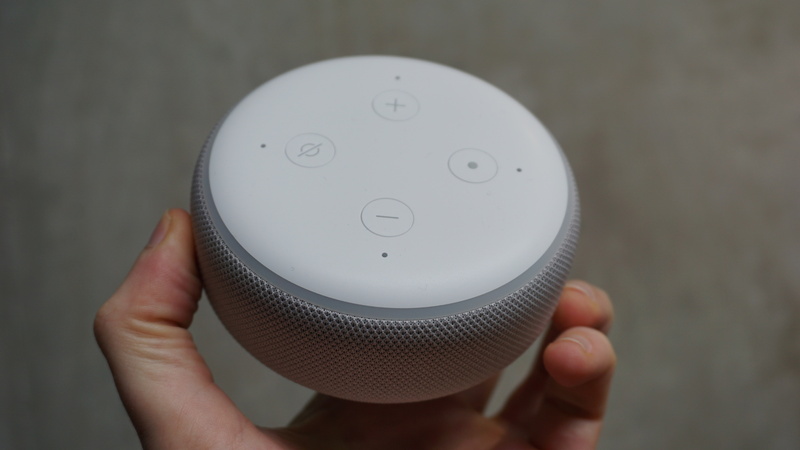 Looking past the spotty Skills library, Alexa was and still is a fairly competent smart assistant and if you just plan on using the speaker for tasks like getting your news and weather or controlling your smart devices, Alexa is more than up for the job. The marquee feature of the Amazon Echo Dot (3rd Generation) is the revamped audio system that helps make the Echo Dot sound better than any version prior. While there’s very little debate that the latest Echo Dot does, in fact, sound better than the 2017 model, it’s not quite the device you’d want to listen to a whole album on - vocals are easily lost in a cacophony of sound, and bass is nearly non-existent (a given considering how small the Amazon Echo Dot is). So, yes, while some music does better on the Echo than others (prog rock is not the Echo Dot’s friend and rap is just OK), you’ll still want to connect the Echo Dot to an external speaker when it’s time for some heavy listening. Unfortunately connecting devices to the Amazon Echo Dot isn't as simple as it could be: Disappointingly while Google has figured out a universal way to connect devices via Chromecast Built-in, Amazon needs to rely on Bluetooth for its connections. That’s not a dealbreaker by any means, but it can be a bit of an annoyance if you have friends over who all want to take turns playing DJ. 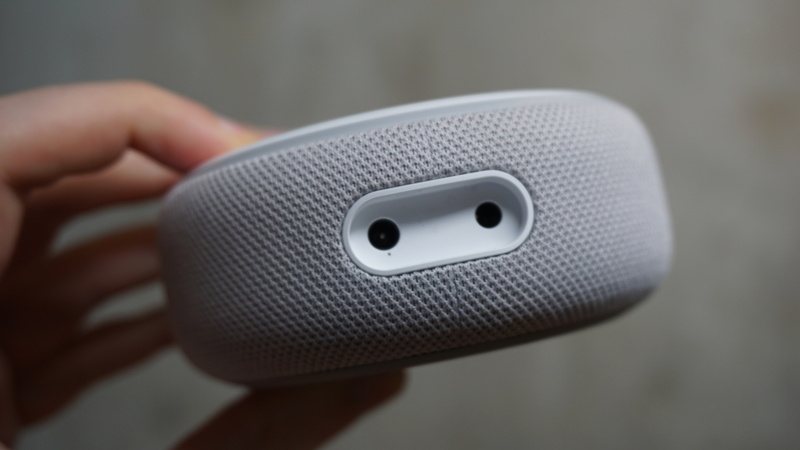 It’s also interesting that Amazon is pushing the audio performance aspect of the speaker as we found during our testing that it was the microphones and call quality that left us most impressed. Friends and family we spoke to using the Amazon Echo Dot claimed that the quality was nearly as good - if not better than - the speakerphone quality on our phones. That speaks to the quality of the Amazon Echo Dot’s microphone array and the noise-reduction algorithm Amazon has implemented for phone calls. Calling, therefore, remains one of the best features of the Amazon Echo Dot - alongside smart device control, of course. If you’re looking for a device to give to family members who might not call as frequently as they should, the Amazon Echo Dot's ability to ‘Drop In’ and make on-demand calls to anyone, anywhere in the country remains a great solution. Outside music, the Echo Dot has exactly the same amount of smarts as the full-size Echo. You can use it to set timers while you're cooking, have it give you a one-minute news roundup while you're eating your cereal in the morning, or even order an Uber if you've entered your Uber login details into the Alexa app. If you have a set routine you'd like it to perform, Alexa can string multiple commands together - like, for example, you could have your lights, heating and TV switched on - in one short phrase. This is handy once you stock up on multiple smart devices. 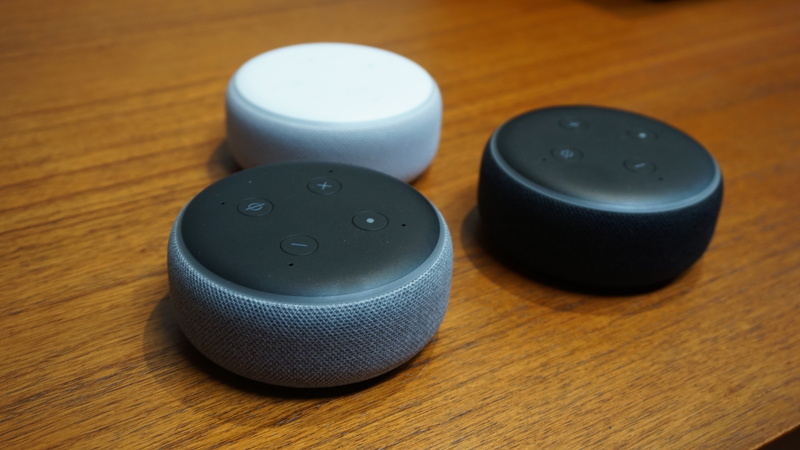 We've also recently seen a slew of new voices for Alexa, as well as a new Brief Mode that makes Alexa less likely to respond to your voice (to stop the voice assistant constantly interjecting in conversations) and voice shopping via the Amazon Store. All these features are great and make the Amazon Echo family of devices the leader in the field, even despite some tough competition from Google Assistant. If you’re in the market for a cheap wireless speaker that can make calls, control your smart home and play the occasional song or two, the Amazon Echo Dot is easily one of the best smart speakers on the market for you - even better than the Google Home Mini in terms of call quality and music playback. That said, if you plan on sitting down for a longer listening session, we recommend connecting to an external speaker (remember to pick up a 3.5mm auxiliary cord!) or opting for one of the more audio-adept Amazon speakers like the Amazon Echo (2nd Generation) or new Amazon Echo Plus with an Amazon Echo Sub. Your music will thank you.